Spring heralds a few things for Melburnians – perhaps more drinking Little Fat Lamb cider in swish rooftop bars than getting amongst traditional lambing – but easily one of the biggest celebrations and social events of spring is the Melbourne Cup Carnival. Taking place over four days, visitors flock to the city from across the globe to show off the newest fashions, drink, eat, be merry… and occasionally watch a race or two. 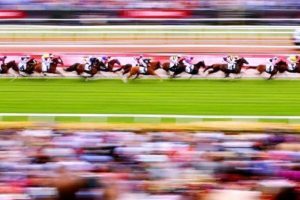 For those of you who have little idea about what happens when, where, or why; this brief guide to the biggest events on the racing calendar should get you into the swing of things nicely. When: The main race days fall across four days spanning from the 29th of October to the 5th of November. 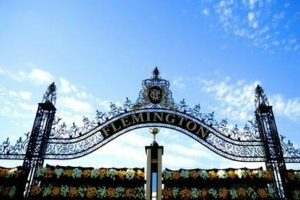 Where: All major race days are held at Flemington Racecourse, which is accessible by train, bus, tram, car and helicopter (yes you read that right). Why: Why not? Each day has its own individual feel to it – so below you’ll find a little bit of detail on each to help you select the day which best suits your tastes. Who wants to be a millionaire? Well, probably most of us – but the jockeys of the AAMI Victoria Derby Day actually stand a chance, with over a million in prize money up for grabs for just one race; the Group 1 AAMI Victoria Derby (previous winners of note include Phar Lap – pretty sure you’ll have heard of him). 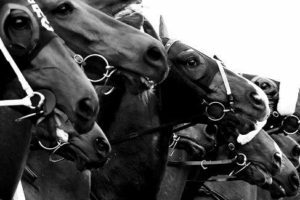 The rest of the day is taken up with the 1200m Group 1 Coolmore Stud Stakes, the 1600m Group 1 Myer Classic, the Group 1 Longines Mile, and finally, the Group 3 Lexus Stakes. If all of that means nothing to you, then perhaps something trackside might be more your speed. It’s not just the horses being put through their paces on Derby Day, with the Myer Fashions on the Field competition. Want to take part? Register here before the day, and get your fashionista fix for the year. Fun fact: For each day of the carnival there is an ‘official flower’ which you can pick up at Flemington gates on the day, if you’re so inclined. For Derby Day, the foliage of fancy is the Cornflower – so go ahead and wear some blue for some extra points in the aforementioned fashion stakes (disclaimer: this is not official information and will almost certainly not get you any extra points). 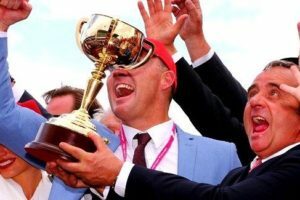 Widely considered the shining jewel in the carnivalesque crown, the Melbourne Cup Day offers prize money of over six million big ones, not to mention a Solid. Gold. Trophy. With that knowledge, it really stands to reason that the official flower is the gold (read: yellow) rose. We can dream, right? Colloquially titled ‘ladies day’, Crown Oaks Day not only boasts the crowning of the Myer Fashions on the Field winner, but also showcases ladies of the non-human variety, with the ‘fastest fillies in the land’ partaking in the Group 1 Crown Oaks Race. It may not come as a surprise that the official flower of Crown Oaks day is the pink rose (what else?). So, ladies: get your glad rags on, pour a glass or two of the finest champers and place those bets. The penultimate day of the races comes in the family-friendly form of Emirates Stakes Day, marked by the official red rose. On the track itself, the day includes the 1000m dash for two-year-olds at Group 3 level, the Group 3 Queen Elizabeth Stakes over 2600m, the weight-for-age Group 1 Darley Classic, and comes to a close with the Group 1 Emirates Stakes. For the less betting-minded amongst the crowd, there is an array of alternative, free events taking place trackside. 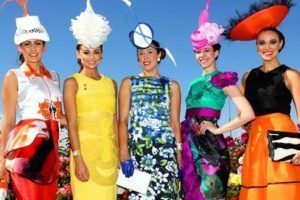 One of the highlights for the fashion forward youngsters in the crowd is the Emirates Day Fashions on the Field. So there you go. Now you can say you’re something of a racing connoisseur, whether you attend all four days, or none of them. In saying that, if you’re not chomping at the bit to get amongst the races in any way shape or form, but still fancy a little horsing around during the week (sorry); well then fear not. Such is the array of world-class entertainment, fashion, social events and dining, that there is sure to be something to tickle your fancy. Find some of the best bars, restaurants, and events around Melbourne here.